(Newser) – A federal judge in Montana has blocked construction of the $8 billion Keystone XL Pipeline after criticizing the Trump administration for not properly studying its environmental impact. 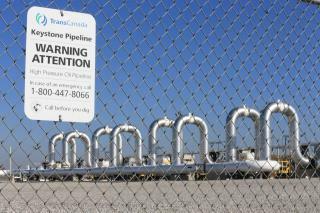 US District Judge Brian Morris' order on Thursday came as Calgary-based TransCanada was preparing to build the first stages of the oil pipeline in northern Montana, per the AP. Environmental groups had sued TransCanada and the US State Department in federal court in Great Falls. Morris ruled that the government's analysis didn't fully study the cumulative effects of greenhouse gas emissions, the effects of current oil prices on the pipeline's viability, or include updated modeling of potential oil spills. Why did this oil company run the line through the U.S. when they could have run it to the Pacific coast? The Pacific coast was closer. Do you know who owns this oil? American billionaires. No worries everyone we have the judicial branch to keep deplorable Trump in line.